Craco old town (Matera Province, Basilicata) was abandoned in 1963 due to recurring landslides. Between 1959 and 1972, portions of the village were severely damaged and rendered uninhabitable by a series of landslides. 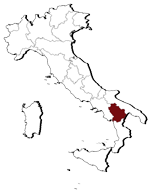 For safety, the entire population of 1,800 residents moved to Craco Peschiera in 1963, leaving the town uninhabited. In 2010, Craco has been included in the watch list of the World Monuments Fund. Craco has been the setting of many movies: The Passion of The Christ (2004) by Mel Gibson ; La lupa (1953), by Alberto Lattuada ; Christ Stopped at Eboli (1979), by Francesco Rosi ; The Sun Also Shines at Night (1990), by Paolo and Vittorio Taviani ; Quantum of Solace (2008), by Marc Forster ; The Nativity Story (2006), by Catherine Hardwicke, etc. Previous articleArchitecture Under Fascism: E.U.R.